Today I would like to introduce you to the gourmet food company called Sunrise Specialty Foods based out of the great state Pennsylvania, my home state! The company has been in business for over 20+ years and offers nationwide shipping and they deliver close to 500 homes in the Pittsburgh, PA. area. The company offers over 100 premium quality food items such as: USDA Prime Beef, Chemical-Free Wild Caught Seafood, Bison, Elk, Free Range Chicken and more! Every item is individually vacuum packed, flash frozen and delivered to your front door. These are all high-quality food products, that just can't be found in your local neighborhood grocery store. The company offers free shipping on all orders over $200.00, so fill up that freezer and save! Everything comes nicely shipped in a cooler with lots of dry ice to keep them frozen. Over the next several weeks I will be reviewing several of their food items here on our Shakin 'N Bakin Foodie Blog and our sister Two Classy Chics blog. I think you will love all of the food selections and I will be sharing some really easy recipes to go along with them. 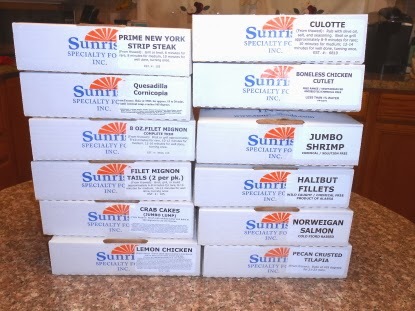 Today we are reviewing the Culotte USDA Prime Beef Steaks from Sunrise Specialty Foods. You can order them two different ways: 1. A box of four 8 oz. Culotte Steaks (or) 2. A box of twelve 8 oz. Culotte Steaks. These steaks are so dang good...I suggest going for the bigger package! These are a prime cut of top cap steak that is completely trimmed and is one of their most popular prime steak selections. It cooks up like a New York Strip but is much heartier in flavor. As a USDA PRIME, you know it has got to be good! I first want to state that my hubby and I are complete "steak" snobs! We eat steak here in our home at least one a week, if not more. We are very picky about our meat and we like it thick cut, lean, juicy, moist and flavorful. We do NOT buy junk meat here in our home and feel that it is worth the added expense to get top-notch beef. The steaks come individually vacuum sealed and inside a box. There is a label on the box that tells you how to prepare them. We decided to follow their instructions when we made them. (From Thawed) - Rub with olive oil, salt and seasoning. (We used McCormick Steak Seasoning). Broil or grill them for approximately 8-9 minutes for rare, 10 minutes for medium and 12-14 minutes for well done, turning once during the cooking process. We like our steaks medium to medium-well done and found that it only took us about 10 minutes to grill them from start to finish. How is that for a quick, weeknight gourmet dinner? You bet! Hubby was in a weird mood that night and made buttered corn and cheesy pasta to go along with them. Not my first choice for sides...but it was what he wanted! These Culotte Prime Steaks were the BEST beef steaks we have had in many years! That includes the ones we eat when dining out and the ones we buy & make at home. I kid you not...these were the BEST! They were moist, tender, flavorful and almost melt in your mouth! They are the perfect proportions too at 8 oz. which filled up our tummy's fast. We have already added these to our shopping list and when we empty out our freezer over the next several weeks...we will definitely be purchasing these! I seriously don't think you can get a better steak, certainly not one delivered to your front door! Head on over to Sunrise Specialty Foods and take a look around. You will be pleased to see their large variety of gourmet food products that you can purchase and have sent to your home. Over the next few weeks keep checking out the foodie blog and our sister Two Classy Chics blog for additional foodie reviews from this great company.